In 1992, the Nearfield Acoustical Processor replaced the RUM Reactor. In 2002, there was another technological breakthrough which led to the development of the Dual-Frequency Reactor. We also have larger and more efficient transducers capable of tolerating brownout periods. If needed, we can still provide the RUM and NAP Reactors. With Generators, our Adjustable Power Control Generator (APC), is the preferred choice due to superior power control circuits and the ability to operate during brownout conditions too. However, our Automatic Gain Control Generator (AGC) is still available upon request. The Dual-Frequency Processor is a powerful continuous-flow Dual-Frequency Reactor. This parallel diaphragm plate configuration provides intense acoustic activity for demanding sonochemical and/or sonophysical reactions. The DFR Reactor produces a uniform sound field of intense ultrasonic cavitation which maximizes the reaction kinetics within the linear space allotted. The sound energy produces drastic process rate changes and quality enhancements down to a molecular level. Controllable ultrasonic parameters enhance chemical process methodologies and sonochemical reactions. The two Diaphragm Plates form a single ultrasonic reaction chamber which concentrates the sound energy from these independent sources. The reaction chamber is where the process solution flows through in order to be ultrasonically treated. This configuration produces an absolutely uniform energy profile for complete and thorough treatment of all material passing through. Particle fragmentation and deagglomeration. Increased instantaneous particle velocity improves surface wetting and liquid/solid interface hydrodynamics. Agglomerated particles are pried apart for chemical activation of new surfaces. Every particle is individually scrubbed down into the sub-micron size domain. Micro-emulsions decrease the emulsifying agents required for stability. Reduce operating costs and enhance operation efficiency. Reductions in raw materials due to molecular mixing. Drastic increases in mass transfer rates & molecular diffusion. Ultrasonic hardware that provides continuous processing performance year after year. Reliable and durable systems made with silver-brazed magnetostrictive transducers. The acoustic output performance will not degrade nor change with time for this ultrasonic processor. Many transducers are driven synchronously to produce a uniform energy intensity on each diaphragm plate. The inertia produced by our massive transducers is insensitive to fluctuating process parameters which can suppress acoustic energy transmission and system performance. Many generators are synchronized to drive our high capacity NAP Reactors. Large systems deliver high-throughput performance for the most demanding installations. The NAP Reactor's design and construction techniques assures reliable system performance. There are no moving components that can create process stream contamination. The DFR-3606-HP with a 1kg Transducer. This 4kW DFR Reactor is shown next to a typical transducer element used within our 6 inch wide reactor series. Each transducer is silver-brazed to the diaphragm plate for an acoustically perfect junction. We warrantee the performance of our transducer assembly for 10-Years. The DFR-3606-TCC with an Inline Spacer. This DFR Reactor is equipped with our Thermal Controlled Core Option, (TCC equipment series). The Inline Spacer allows the process solution to pass through the ultrasonic chamber for effective and uniform material treatment. The inline system is easy to install in existing flow streams. The DFR-3606-HP-TC with a NEMA-12 Generator/Electrical Enclosure. 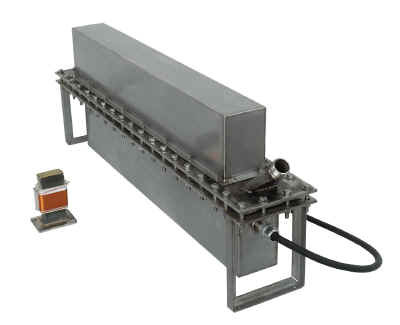 The Temperature Control feature provides stable reactor temperature control from -10° C to 150° C. The processing chamber's temperature is maintained by heat transfer fluid flowing through internal manifolds located inside the transducer covers. 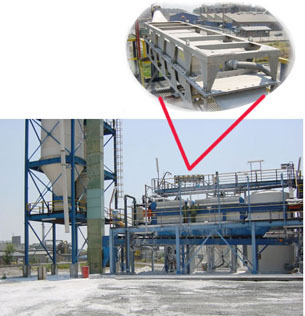 Hot fluid may be used to quick start the system upon startup or for high-temperature operating conditions. The ultrasonic generators are located inside a NEMA-12 Electrical Enclosure, (aka. IP55). 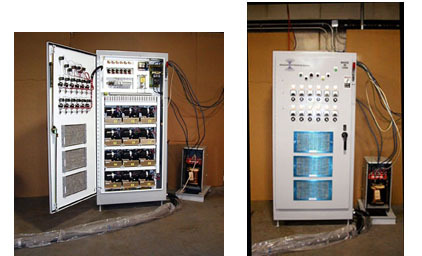 This system is provided complete with isolation transformer and flanged mount disconnect switch. The ultrasonic reactor may be remotely activated and monitored by your process computer control network. A DFR-1808-TC with a Sparged Reaction Cell mounted in a Sound Abatement Enclosure. 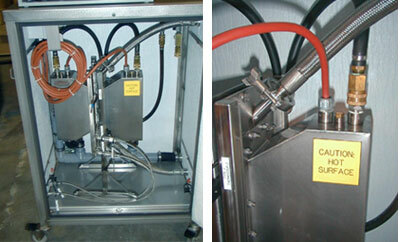 This High Temperature DFR Reactor is equipped with a dual-port Sparged Reaction Cell. The primary feed is located below the ultrasonic processing chamber. The secondary feed is positioned in the ultrasonic mixing zone for instant acoustic treatment upon initial contact. The ultrasonic intensity is adjustable to control treatment performance. A DFR-3606-HP mounted within a Sound Abatement Enclosure. 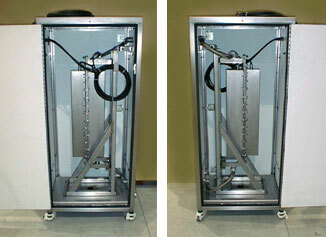 This Sound Abatement Enclosure is equipped with quick opening doors for instant reactor access. The conveyance line connections and ultrasonic power cables attach to the outside envelope of the sound enclosure. The reactor may be easily removed when required. This DFR Reactor is packaged for export to Europe. The system is delivered completely assembled and wired for the primary voltage available. We use IEC/EC wiring methodologies to simplify equipment familiarity and service. The Sound Abatement Enclosure is mandatory to reduce airborne noise to acceptable levels. 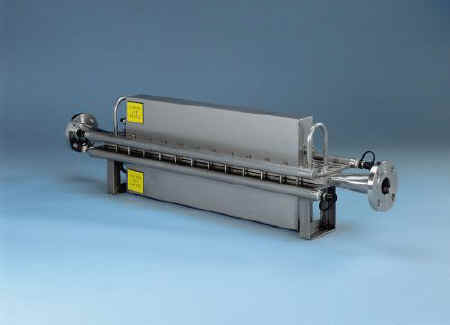 The DFR Reactor can be packaged for quick full washdown and inspection. The Reactor may be disassembled, separated, cleaned, inspected and reassembled within minutes. 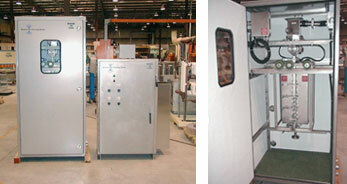 This DFR Reactor and Generator/Electrical Enclosure are both rated as NEMA-4X, IP66, for full washdown service. with variable ultrasonic power control. All wetted surfaces are 316L stainless steel and teflon. Reactor's Working Temperature: -35° C to 120° C.
Reactor's Working Pressure: Vacuum to 45 psig, (3 bar). (NEMA-6, IP67 for the TC equipment series) . Variable ultrasonic power (0% to 100%) with indicating meters. Generator Enclosure Rating: NEMA-1 or NEMA-12; IP20 or IP55.